I became pretty obsessed with these crackers a couple months ago. I started making them while I was spending a couple months in Hawaii with my brother, sister and brother-in-law, and we would demolish a batch in a couple of days. I also brought these to a event where I was catering the snacks, along with a basil hummus, and people loved them! The aroma while they’re in the oven is just like the smell of fresh bread in a bakery. Divine. So why do these crackers rock? 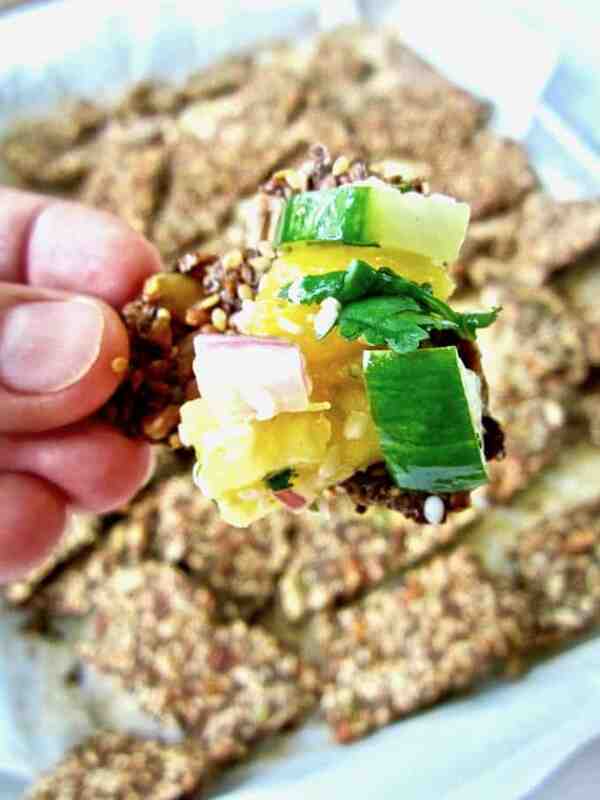 versatile – pair with dips, spreads, vegan cheese, raw veggies veggies, avocados, etc. 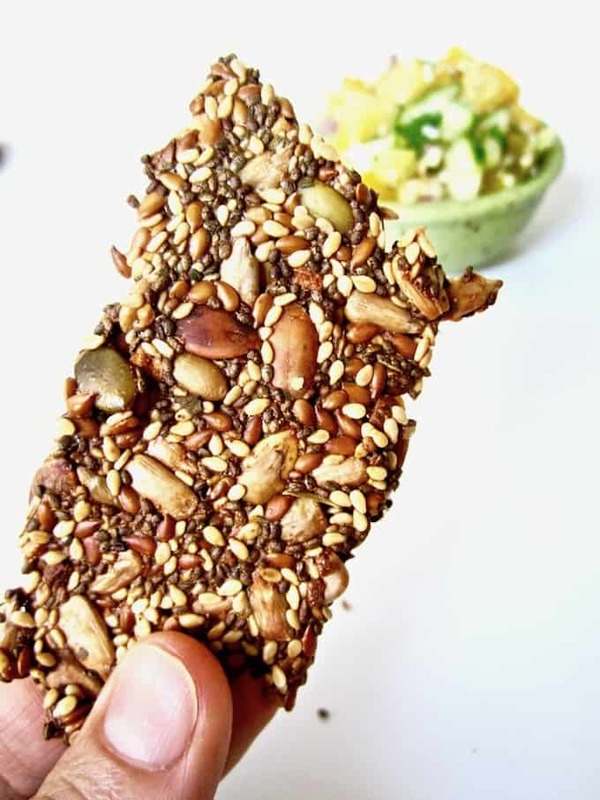 Would you believe it if I told you that these crackers are literally ONLY seeds and seasonings?! No grains; no fillers. Pure goodness. You simply combine a mix of different seeds with water and then let chemistry do its job. 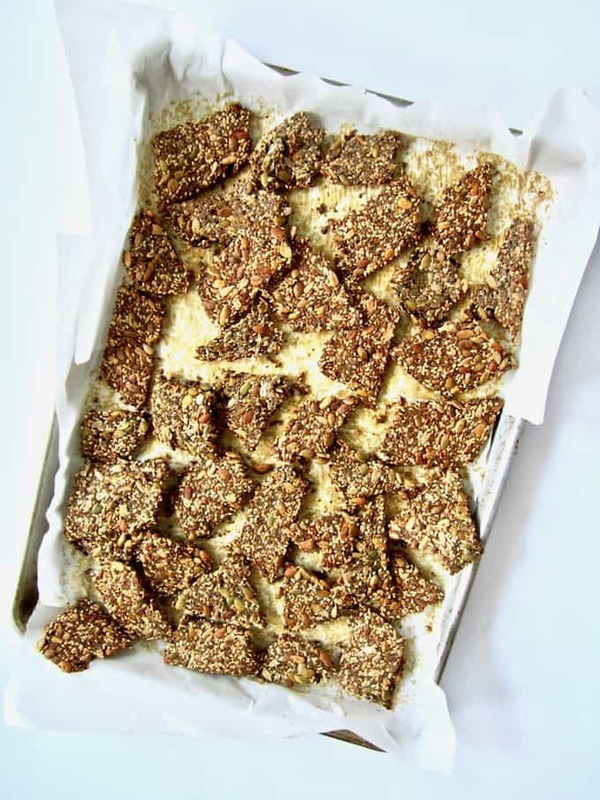 The water will expand the flax and chia seeds, making a gelatinous, sticky texture that you spread evenly onto a baking dish. Then you lightly score the mixture with a knife or pizza cutter, making the crackers easier to flip half way through baking. Patiently wait an hour, and then your crackers are ready! Here are just a FEW of the amazing health benefits of seeds! What does this all mean? Just to name some of benefits that research has shown, eating seeds can contribute to energy boosts, heart health, reduced inflammation, enhanced immune system functioning, lower cholesterol and an increase in mood and brain functioning. YAY for plant based eating! 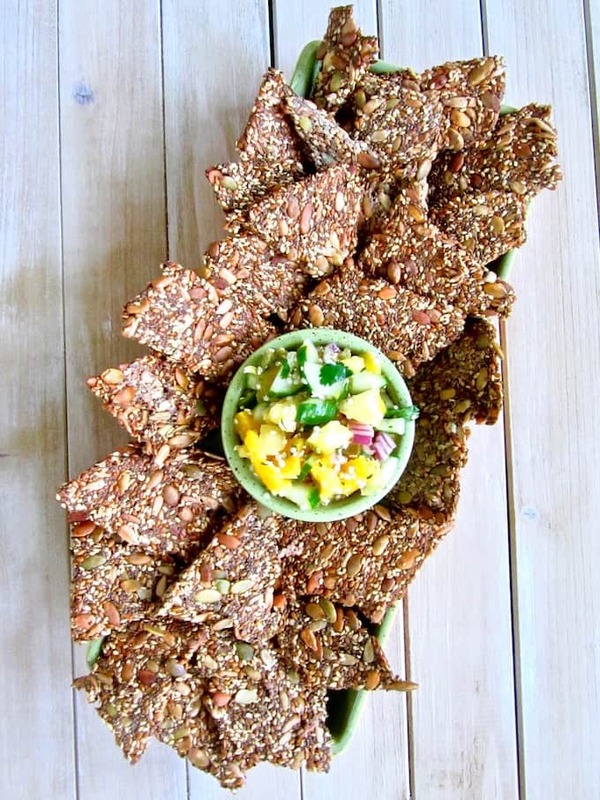 With summer nearly here, I was craving something fresh, fruity and crunchy to go with these crackers. 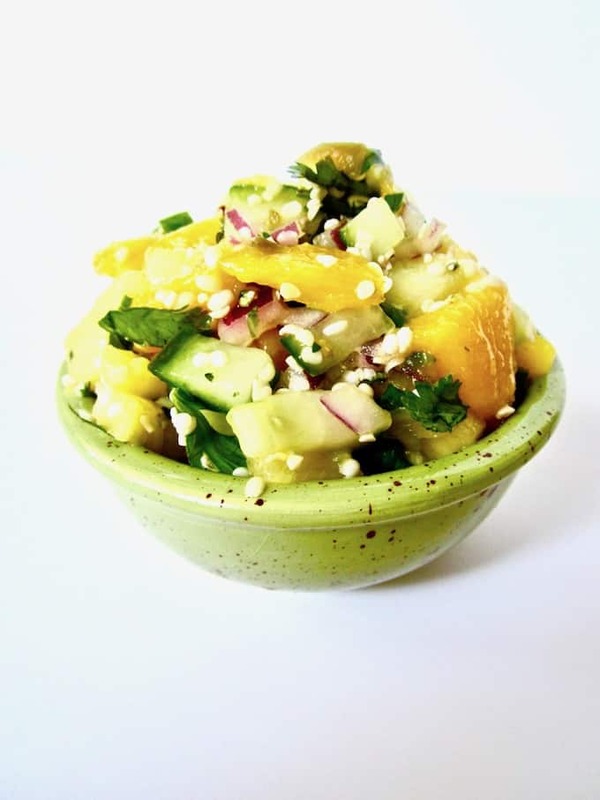 Combining typical, zesty salsa flavors like lime, red onion and jalapeño… with the sweetness of pineapple and mango… with the cool crunch of cucumber… makes for a delicious chunky salsa, worthy of summertime! 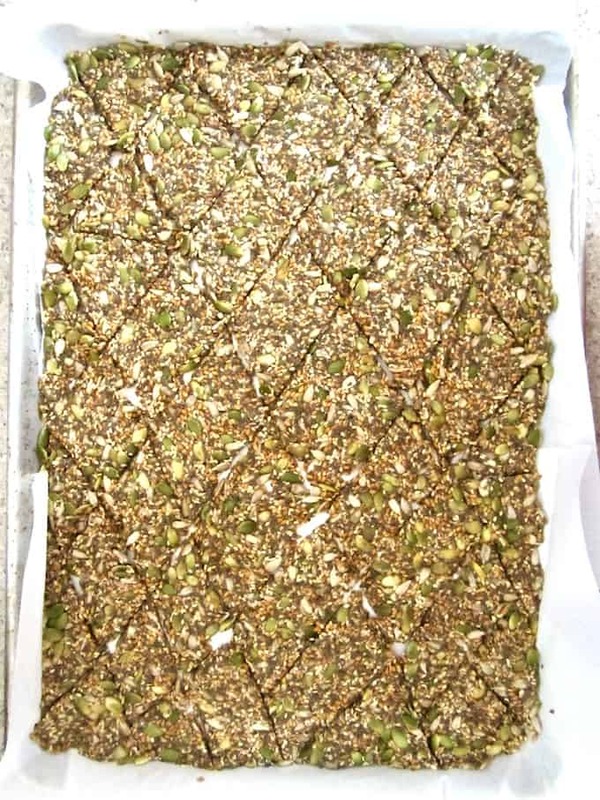 I also added a bit of hemp seeds, for a new flavor dimension and another punch of protein. If you like your salsas less chunky, you can cut the fruit and veg into smaller pieces, or even consider throwing it all into a food processor for a couple quick pulses. I hope you enjoy these delicious snacks! For other sugar free snack ideas check out my Tahini Energy Balls, Raw Tomato Walnut Pate on cucumbers, or 5 Ingredient Cinnamon Protein Bars! 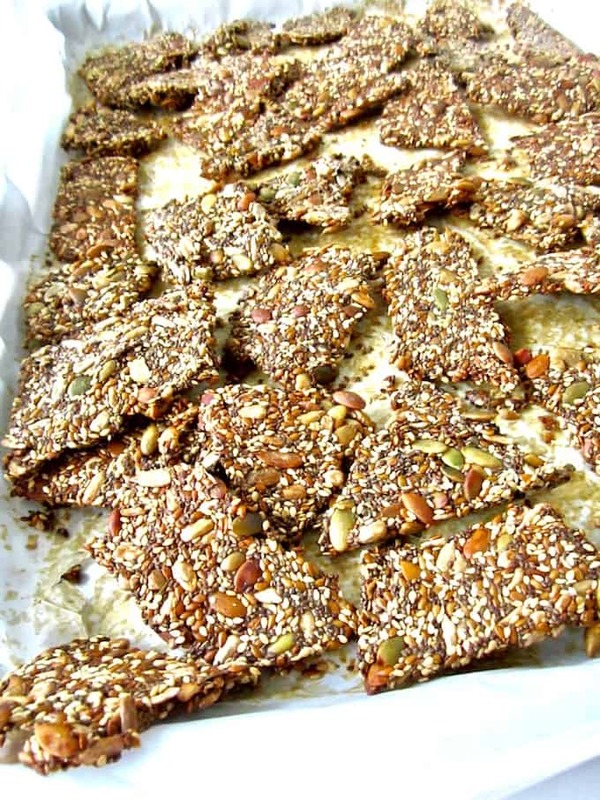 These super healthy, high protein crunchy crackers are made simply out of seeds and seasonings. Pair with fresh, zesty, sweet and chunky salsa for a great summer snack! Combine all ingredients into a bowl and stir until well combined. Let sit for 5 minutes until liquid is absorbed. Line a large baking sheet with parchment paper and spray it with cooking spray. Spread the mixture evenly onto the sheet, all the way to the corners and make it as even as possible. You want the mixture to be thin, about 1/4 inch. (thicker is ok too, the crackers just won’t be as crunchy). As you’re spreading, if you spread TOO thin where the mixture comes up off the paper and leaves a hole, just redistributed some of the mix from a thicker patch to where it’s thinner. It’s not an exact science - the point is, just make it as even as you can! Using a pizza cutter or knife, lightly score the mixture into whatever shapes and sizes you want - squares, diamonds, etc. Again, since the mixture is sticky, be careful not to press so hard where the mixture moves and mounds up. Sprinkle the top of the mixture with more salt if desired. Bake for 30 minutes. Take the crackers out of oven and flip them over. 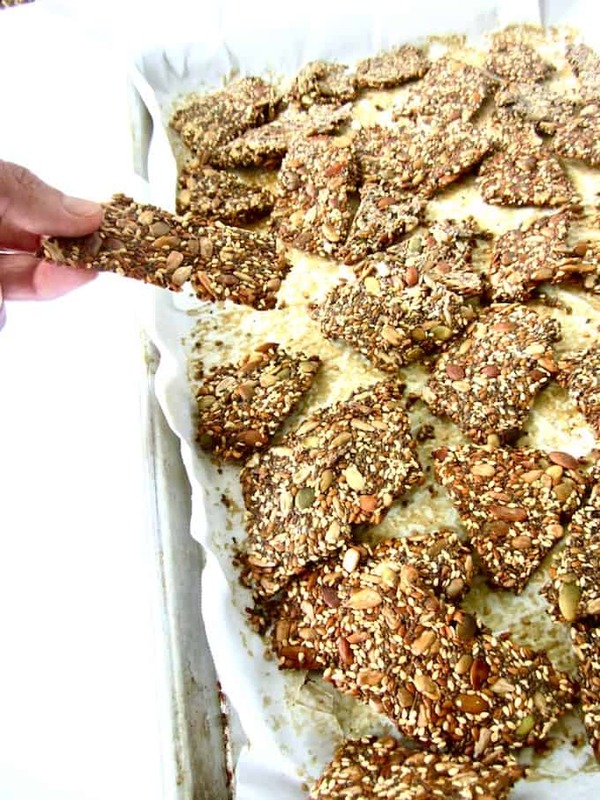 You’ll need your knife or pizza cutter again now that the crackers are firmer. As you go, you can slice where needed to break them apart and flip. Bake another 20 minutes (or 25 - 30 minutes depending on thickness). Let cool and store in an airtight container. For maximum freshness, consume within 5 days. Combine all ingredients in a bowl. Makes about 3.5 cups. I love the salad combo! Anything with fresh mango in it and i'm in! The crackers look delicious! I am so excited to try both these recipes! That salsa has me drooling, and I've never made crackers before. They look so amazing! Thanks Melissa! I hope you try it, all those flavors go so well together! OMG! That salsa. I want to eat it right now. 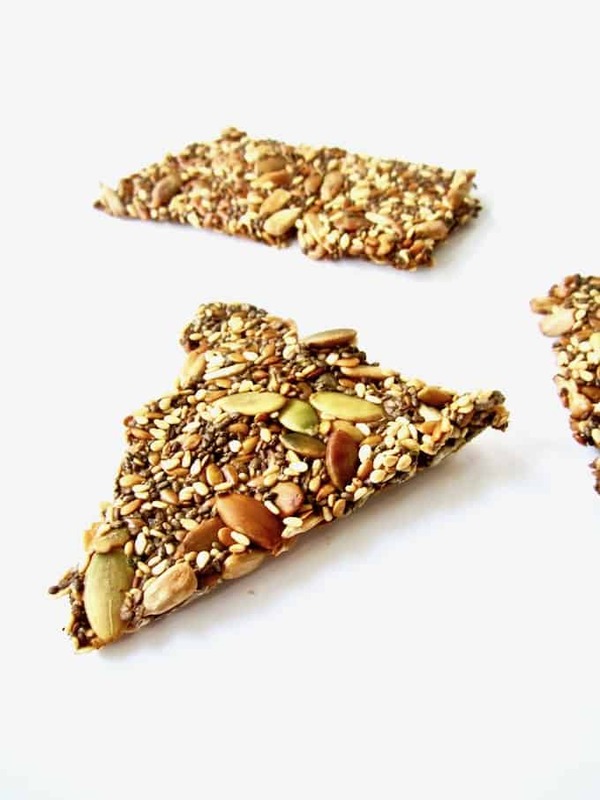 I love those seedy crackers. I bet they are delicious. The salsa looks awesome too. They are a match made in heaven!